Choosing which college to earn an online degree from is no simple task. But for budget-minded students, looking at Iowa’s colleges and universities with online programs may be a good place to start. At the University of Iowa, 45 percent of students are able to graduate debt-free, and many programs offer the same tuition rate for online students whether they are current residents or out-of-state students. 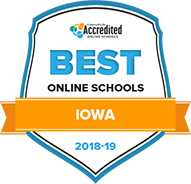 This page will help you learn more about the best online education options at colleges in Iowa, and answer important questions on transfer credits, paying for your online degree and getting on the path to college. While price is often a determining factor in choosing an online college, the value, flexibility, and quality of the curriculum also play critical roles in the decision-making process. Iowa has more than 60 public and private schools to explore, and according to research from Learning House, 52 percent of students pursuing an online degree request information from three or more schools to help them make a more informed decision. If you’re curious about which colleges and universities in Iowa offer the best combination of quality and online student support and success, we’ve made a list of leading schools below. Iowa State University's Online and Distance Learning program offers over 50 degrees and certificates that, with the exception of 3 degrees, can be completed 100% online. Fields of study include agriculture and life sciences, human services and engineering (with 11 master's-level engineering degrees available). In addition, a number of master's degrees and certificates in the subjects of community development, family financial planning, gerontology, dietetics and youth development can be earned online through ISU's partnership with the Great Plains Interactive Distance Education Alliance. Out-of-state students taking only online courses at Iowa State pay the same tuition rates as Iowa residents. Mount Mercy University is a private, 4-year, Catholic, liberal arts institution with its campus located in the central eastern Iowa city of Cedar Rapids. Mount Mercy offers 10 degrees that can be earned fully online, including bachelor's degrees in the fields of applied management, business, health care administration, human resource management, management, marketing, nursing (RN to BSN) and religious studies. Master's degrees in criminal justice and business administration are also available. Mount Mercy's online degrees feature an accelerated course format, and classes may be accessed asynchronously, meaning students may complete their coursework at any time. The University of Iowa is the second-largest university in the state and one of the top public research universities in the nation. Through its Distance and Online Education portal, UI offers a substantial number of undergraduate and graduate degree and certificate programs that can be completed fully or partially online, in a wide range of subjects. Fields of study include business, education, nursing and healthcare, political science, social work and many others. Coursework can be accessed at any time, but students are required to meet certain deadlines for their coursework and attend an online virtual classroom meeting at a specified time and date. Graceland University is a private liberal arts university affiliated with the Church of Christ, with campuses in Lamoni, Iowa, and Independence, Missouri. Graceland offers a range of online undergraduate and graduate degree and graduate certificate programs with an emphasis on the fields of education, nursing and business administration. Programs of note include: a Doctor of Nursing Practice with organizational leadership concentration, which combines online coursework with field experiences and supervised practice hours; and a Master of Arts in religion, with classes that can be completed either fully online or with one face-to-face session conducted in Independence, Missouri, during the fourth week of studies. The University of Northern Iowa's UNI at a Distance program offers nearly 40 bachelor's degrees, master's degrees and certificates that can be earned either fully or partially online. An extensive number of degrees and certificates are available in the education field. Other areas of study include criminal justice, public policy, social work, technology and more. UNI at a Distance incorporates a number of course delivery methods, including asynchronous, guided independent study; interactive video conferencing; on-site visits; as well as blended formats that incorporate two or more of these methods. Additionally, many courses can be completed fully online via eLearning. St. Ambrose University is a private, liberal arts institution affiliated with the Roman Catholic Diocese of Davenport located in the city of Davenport, Iowa. St. Ambrose offers 4 undergraduate degrees (Associate of Applied Science, Bachelor of Business Administration, Bachelor of Business Administration-Accounting, and RN to BSN) and 3 graduate degrees (Master of Criminal Justice, Master of Business Administration, and Master of Public Health), all of which can be completed fully online. A maximum of 90 credit hours (earned at other colleges and universities or through credit by exam, military credit or experiential learning) may be transferred and applied to an online bachelor's degree program at St. Ambrose. Northwestern College is a private, Christian liberal arts college affiliated with the Reformed Church in America located in the community of Orange City, Iowa. Through its Graduate and Adult Learning Programs, Northwestern Iowa offers three degrees that can be earned online: a Bachelor of Arts in early childhood education; an RN to BSN (Bachelor of Science in Nursing); and a Master of Education. The Master of Education program is designed to be completed in 2 years or less and provides 7 endorsement track options. Additionally, Northwestern Iowa offers 4 education endorsements and a coaching authorization that can be earned 100% online. Buena Vista University is a private, four-year school affiliated with the Presbyterian Church and located in the northwest Iowa city of Storm Lake. BVU's online program offers 18 undergraduate and graduate degrees that can completed through distance learning. Fields of study include accounting, business, criminology and criminal justice, education, health services, psychology and many others. In addition, BVU and the Iowa Community College Online Consortium have formed a partnership that allows a student to earn an associate degree at any of the 7 affiliated community colleges and then complete their bachelor's degrees 100% online through BVU. Upper Iowa University is a private institution with its residential campus located in the northeast Iowa community of Fayette. UIU's Distance Education program currently offers almost 40 undergraduate and graduate degrees (associate through master's), as well as several undergraduate and graduate certificates, all in an asynchronous online format that allows students to access and complete their coursework at any time. Fields of study include business administration and finance, criminal justice, public administration, psychology, and many others. UIU's Online Program offers 5, 8-week classes and an accelerated 6-week summer session, which means that a student need not wait longer than two months to begin his/her studies. Briar Cliff University is private, Catholic Franciscan, liberal arts institution located in Sioux City. Briar Cliff offers online degree-completion programs in accounting, business administration, health sciences, RN-to-BSN, operations management and social work. Students enrolling in these programs must possess at least an associate degree or a specific number of college credits. Briar Cliff allows degree-completion students to save time and money by applying up to 90 credits of previous college coursework toward their degrees or to earn credit for prior learning through an exam. Courses are fully online, and most programs can be completed with 39 credits, though the RN-to-BSN is 30-34 credits and the Bachelor of Social Work is 47 credits. How can I find which online colleges offer the degree I’m looking for in Iowa? A college or university’s website can provide students a lot of background information on the online degree program and class offerings a school provides. For example, Iowa State University offers the most online programs in the state, and you can browse through the online schedule of classes on their website. The University of Iowa offers an easy search portal that breaks courses down by program type and location. You can also take a sample online course to get a feel for the learning experience the school offers. If you can’t find what you’re looking for on a school’s website, try our search option to the right, or reach out to the school’s you’re interested in directly. The admissions office at any of Iowa’s colleges will be able to point you in the right direction. Which online schools in Iowa will accept my transfer credits or work/life experience? At Briar Cliff University, you can apply up to 90 credit hours towards your online degree. Students can be granted work and life experience credits at Iowa State University based on their score on a knowledge assessment called the College Level Examination Program (CLEP). Military service credits are offered at many colleges in Iowa, such as the University of Dubuque, which honors veteran credit through both the CLEP and the Veteran’s Joint Service Transcript (JST) assessments. Iowa State University also tmake the transfer process easier to understand with detailed transfer planning resources and policies specific to each area of study. If you can’t find information online, know who to call at Iowa colleges and universities to discuss your credits, and be prepared to request copies of your transcript. How Much More Do College Grads in Iowa Make? According to the Bureau of Labor Statistics, people with a bachelor’s degree earn, on average, $1,173 a week, compared to $712 per week for people with only a high school diploma. In Iowa that discrepancy is even greater; jobs that require a bachelor’s degree pay, on average, more than $1,300 per week, compared to approximately $580 per week for positions requiring a high school diploma. A 2018 report from the Iowa Department of Labor shows the unemployment rate in the state has recently fallen to its lowest level in 18 years. While many people associate Iowa with agriculture, employment trends in the state are shifting toward manufacturing, trade, transportation, education and health. If you comb through the data from the Bureau of Labor Statistics, which outlines occupations by average wage, you’ll see that the highest paying jobs in Iowa are for those highly educated in medicine, posting average salaries between $180,000 and $264,000. Your online learning experience should offer the same cutting-edge technology, quality curriculum and classroom support that on-campus students receive. To assure these high educational standards are being met, look for online schools that are accredited. Accreditation means that your program has been assessed and scrutinized by a reputable regulating committee, known as an accrediting body. To best way to determine the accreditation of a prospective school is through the Council for Higher Education Accreditation, which allows you to search by program or institution to ensure it is recognized by a reputable U.S. organization. In Iowa, online colleges and universities are regionally accredited by the Midwestern Higher Education Compact, which is committed to evaluating college curriculums across the state against selected performance indicators, such as affordability, equity and participation. Many of Iowa’s online colleges also go a step further to provide subject-specific specialized accreditations. This ensures specific degree programs are not only providing a quality education, but also meeting industry standards in terms of career preparedness and training. For example, the University of Iowa’s College of Nursing, and their online RN to BSN program, is accredited by the Commission on Collegiate Nurses Education. Tuition rates for online colleges in Iowa vary by institution, and when thinking about your college budget it’s important to consider the impact of extra incidentals like books, lab or technology fees, as well as the length of time it takes to earn your degree and any differences in cost for in-state versus out-of-state students. What are Iowa’s requirements to qualify for in-state university tuition? Reciprocity Programs: If the school you are considering does offer major incentives for residents versus non-residents, check to see if you live in a state that is part of Iowa’s reciprocity, or tuition discount, program. In 2015, Iowa became a part of the Midwestern Higher Education Compact. If you live in one of the 12 states listed, you qualify for a tuition break and have an easier time using transfer credits. Claim Residency: Recently, the University of Iowa tightened its classification for in-state tuition. To receive in-state tuition, students must live in Iowa for at least one year, prove that they moved there for reasons besides school, and work an average of 30 hours per week. Ultimately, you will need to check your school’s rules for classification of residents and non-residents for tuition purposes. Are Online Credits More Affordable in Iowa Than Other Places? As mentioned earlier, online schools in Iowa are affordable compared to national averages, however each institution’s price per online credit varies. Here are how some Iowa colleges and universities stack up against one another in terms of undergraduate tuition rates for online students for the 2018-2019 fall and spring semesters. The rates above are for online tuition only—be sure to make carful calculations and factor in additional fees in order to come up with the true price tag for earning your online degree in Iowa. How Can I Get Help Paying for Online College in Iowa? Carver Charitable Trust: For Iowa residents entering their junior year. The award is for up to $7,600. Future Ready Iowa Last-Dollar Scholarships and Grants: Designated for students pursuing a degree in high-demand industries designated by the State Workforce Board, covers all tuition and fees. Iowa Independent Colleges Tuition Grant: Iowa residents are eligible for this grant, which offers up to $5,650 per academic year at participating schools. Iowa College Student Aid Commission: This website provides a wealth of resources, including a list of state grants and scholarships. Robert D. Blue Scholarship: For students who demonstrate strong moral character. The award is for up to $1,000. This graph outlines the average cost of Iowa colleges and universities to help you estimate how much you’ll pay for online learning in Iowa. You can apply for federal aid through the Free Application for Federal Student Aid (FAFSA). You can also navigate this map of Iowa featuring grant and scholarship opportunities that are specific to programs and demographics. Adult Basic Education – Preparing for college classroom learning includes brushing up on writing, English, math and computer skills, which are the focus of Iowa’s ABE programs. English Language Learners – Classes for English language and literacy proficiency are available for those preparing for college by learning English as a second language. High School Equivalency Diploma – Iowa students who have not completed their high school education can be one step closer to college after completing the state’s HSED program.